Norway’s champion skier Petter Northug was ordered to spend 50 days in jail and fined NOK 185,000 after he confessed in court on Thursday to all charges tied to his drunk-driving spree in Trondheim last spring. His full confession helped win him less jail time than prosecutors had demanded. Northug was charged with driving while under the influence of alcohol, reckless driving, speeding and leaving the scene of the accident with an injured companion inside his badly crashed, sponsored Audi. The most serious charges, however, involved how he lied to police when they quickly found the still-drunk world champion at his home. Northug claimed the companion had been driving his expensive sponsored Audi, not him. 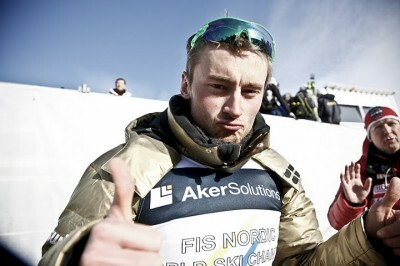 That led to the police initially charging Northug’s companion. When Northug later told the truth, he was then also charged with making false statements and being responsible for false charges. Norwegian court precedent has a long tradition of ordering jail time for these types of offenses. Newspaper Aftenposten reported that in one case, Norway’s Supreme Court even overruled a suspended sentence in a case of drunk driving and false statements about it, and ordered jail time. Prosecutors in Northug’s case had asked for 60 days in jail for Northug and NOK 200,000 in fines, but the local court in Trondheim rewarded Northug’s full confession, and the fact that he first was questioned while still drunk, with a reduced sentence of 50 days. He was also ordered to pay a relatively hefty fine of NOK 185,000 (USD 30,000) and his driver’s license was revoked for at least five years. Northug also has paid compensation to Audi for crashing the car they’d given him. The skier, who wouldn’t allow photos to be taken of him on his way to court or inside the courtroom, admitted he’d been speeding (police claim 83 kilometers per hour, just over 50mph, in a 40kph, or 25mph, zone) when he drove through a roundabout and crashed into a lightpost before the car finally stopped, a total wreck, in the guardrail. Tests showed Northug had a blood alcohol level of 1.65 and then he fled the scene and headed for home, leaving his injured companion in the car. Northug described the late night car ride on May 4 as “without any goal or meaning,” rather just something that two young drunk men decided to do after a night of heavy drinking. It came at the end of a disappointing ski season for Northug, a former world champion who had performed poorly at the Olympics in February and in other competition throughout the year. Northug also admitted that “I made a mistake when I gave a false account (of what happened) at the police station. At the same time I think it was wrong to make such an account so soon after what happened, when I had so much alcohol in my blood.” The judge apparently agreed, reducing his sentence partially because he shouldn’t be held accountable for statements made while still under the influence of alcohol. Northug told the judge that he didn’t remember the details of the crash itself, but knew he was speeding when it occurred. He claimed he was still in shock when he woke up at the police station after spending much of the day after the crash in its drunk tank, and therefore didn’t register the seriousness of the situation. The courtroom was full of journalists from both within Norway and abroad. Norwegian Broadcasting (NRK) reported that Northug appeared extremely aware of the seriousness of his situation now, but gave short clarifications of what he was asked about, answering clearly but speaking low. It’s now up to Norway’s correctional system (Kriminalomsorg) to determine how and when Northug will serve his 50 days in custody. He’s aiming to make a comeback on the ski trails this winter, and may be allowed to serve his time after the season is over. Even one of his arch rivals, Marcus Hellner of Sweden, has said he hopes Northug’s prison term will be delayed until after this year’s Nordic Skiing World Championships at Falun, so that he can race against him. NRK reported, however, that there’s no shortage of jail space in Trondheim as there is in many other Norwegian cities, so there’s unlikely to be any delay in calling him in to serve. It may be an advantage for Northug, who accepted his punishment on the spot, to start serving right away, before the snow starts falling. He may also be allowed to serve his sentence with a so-called “foot link” that confines his activities but would allow him to train. Northug, age 28, holds nine gold and three silver medals from earlier World Championships, along with two Olympic gold medals, one silver and one bronze. He has won 18 World Cup events during his cross-country skiing career and won the overall World Cup twice. There’s still no agreement between Northug, who left the national ski team to train on his own last year, and the national skiing federation on whether he’ll be able to represent Norway at the upcoming world championships or on the World Cup circuit, however. There’s been disagreement over Northug’s private sponsorships in relation to the national team’s sponsorships. Agreement is needed by November 1.